Every sample has a story. Does it really? Frequently misheard as “Yes Oh My God”, excitable teenager Rachael Nedrow couldn’t have imagined how far her exuberant cry would travel when she first uploaded it to YouTube. Skrillex warps the space time continuum, well at least he does on this site. I see in my web site logs that the Skrillex Sample Yes Oh My Gosh post is one of our most popular. Lots of people search google for the origins of the sample. Then they come here – do they find what they want? Maybe they want to do a Skrillex remix. Maybe they want to use the sample in their own music. Maybe they just want to know the story behind the sample. Maybe what they want to know is the story of Skrillex going to meet Rachael Nedrow. Rachael clearly has contributed to Skrillex’ success. Having said that, I believe Skrillex, ex “screamo” band “From First to Last” front man Sonny Moore would have been a huge breakout success without Rachael, and, at least in the cup stacking world, Rachael didn’t need all the Skrillex-related fame she has been showered with. Plus Rachael is clearly driven and talented – it seems she’s a rising tennis star now. Scary Monsters and Nice Sprites is a really stand-out track for Skrillex, and the sample is a real high point. Rachael’s frenetic triumph comes through and lends a lot of energy to the track at the edge of the monster drop. And yet, her comments on her involvement in this have been very humble. She hasn’t (as far as I know) commented publicly on whether she thought Sonny owed her something for the sample. My guess is, she won’t. Sampling in music is not illegal. However, copyright means that reproducing a piece of someone else’s sound may require specific permission from that person. Without that permission, they can take a musician to court over breach of copyright. There are many sound recordings which are already offered with a license to use for samples. Having a license is not the same as having copyright, normally a license says what you can and cannot do with the sample. Getting the rights to use a sample is known as “clearance”. So if Skrillex did not have clearance from Rachel before, my guess is he has one now. He went to visit her at her Oregon home and their meeting was clearly friendly. I bet he ponied up and the autographs went in both directions. I wonder how much cash changed hands. Rachel, Sonny, any comment? Oh – er – and can I use that photo of you two? Thanks. M4SONIC in the studio with more knobs than you. How far can you take the Novation Launchpad? If you are Australian Launchpad maestro, M4SONIC, the answer is “Watch me”. The Novation Launchpad has become the standard hardware controller for Ableton Live, arguably the Photoshop of music production. While the Launchpad eats the cumbersome mouse and keyboard for breakfast, and has been purpose-built in collaboration with Ableton, it has hard constraints compared to the tactile subtleties of a traditional musical instrument. Things are either on or off, there’s no nuance. It’s a grid of rubber button lights. Insert argument about “real musicians” and mere “button pushers” here. Like my Granny always says, are these tech limitations that can be overcome by new hardware or is it just what complainers say instead of skilling up? 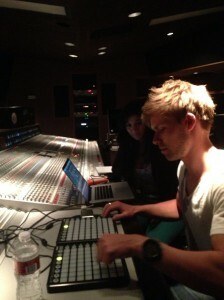 The dude can punch some serious rubber button lights. This proves that great skills are more important than the best tools. Bruce Lee would no doubt agree. In fact if Bruce Lee had not died of excessive awesome and had taken up electronic music production in his retirement, I’m sure he would only need a controller with one rubber button. A one inch button for he could one-inch punch. The device is excellent value, but you can’t expect to become M4SONIC just by owning a Launchpad any more than you can be Beardyman by owning a Kaoss Pad (or four). But of course there are new, more capable MIDI controllers always coming out. Everyone is talking the Push. Another Ableton collaboration, this time with Akai Professional, this baby leaves the Launchpad behind and takes controller tech into orbit. Imagine what M4SONIC could do with something that also offers velocity and pressure sensitive keys! Of course it’s pricier though. Like attracts like. My good friend Dan Rosen (who is not merely very interesting to talk to) hit me with a link to this the other day and I have been debating whether to tip the Strong Like Water ship one more notch towards Skrillex’ direction and relay it to you my subscribers. Skrillex dubstep has featured fairly heavily on this site in the past week. In fact our server nearly melted when Skrillex retweeted us. 390,000 followers will do that. So I thought it might be a good time to share a cool sample discovery that had me laughing out loud. The sample has really strange origins that you would never guess. The track features a really high energy sample right before the drop. This is characteristic of this kind of dubstep – a style some people love and others hate. The sample is of a girl screaming “YES! OH MY GOSH!”. Then the drop goes wild with bitcrushed, modulated bass wobbles. I always wondered what was going on in that sample, what was the story behind it? Was everyone OK? Some of these samples turn me off this kind of dubstep – they’re frequently apocalyptic emergency sounding exclamations. I don’t like the thought of reliving someone’s life-threatening experience – even if it’s only a sample from a movie. In this case the girl is real, Rachael Nedrow from the USA and she is a world champion Cup Stacker. Yes. That’s right. It’s a sport. You stack cups really fast. Yes you read that right. There’s no denying she is fast, and she’s enthusiastic. The apocalypse in this case is her reaction to beating her own best record for a set cup stacking routine (called a “cycle”). Absolutely sound sample worthy. 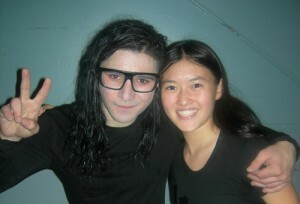 Here she is, “united at last” with Skrillex in full sync. You have to admire their attention to detail. If anything though, I think it’s too close to the original but it’s an excellent yet simple video showing how they achieve this with live instruments. The bass wobble control is an interesting piece of tech I’ll have to look into. The filters seem to be modulated by the little blue thing on the bass player’s thumb. Is that a bluetooth theremin midi control or what? If anyone knows speak up.